Summary: After trained examiners and accomplished business professionals performed a thorough assessment of his work, Dantar P. Oosterwal has been selected as recipient of an internationally recognized award from the Shingo Institute, a program in the Jon M. Huntsman School of Business. The author will receive the award at the Shingo International Conference occurring April 9-13, 2018 in Orlando, Florida. LOGAN, Utah — The Shingo Institute, a program in the Jon M. Huntsman School of Business at Utah State University, has awarded Dantar P. Oosterwal with the Shingo Publication Award for his book, “The Lean Machine: How Harley-Davidson Drove Top-Line Growth and Profitability with Revolutionary Lean Product Development.” A former Harley-Davidson executive, Oosterwal is a lean product development practitioner, advisor, speaker and author. From near-extinction in the early 1980s, the Harley-Davidson Company has risen to worldwide recognition for management excellence and innovation, and is a standout leader in the realm of product development. 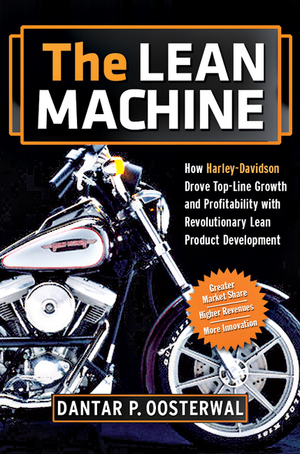 “The Lean Machine” is an inside look at how Harley-Davidson was able to adapt in an ever-changing world and accelerate product development. Rooted in Japanese productivity improvement techniques, knowledge-based product development helped fuel Harley's incredible period of sustained growth. Even after the company earned the PDMA Corporate Innovator Award in 2003, Oosterwal, a Harley-Davidson executive at the time, took the improvement a quantum leap further. By implementing Lean product development techniques, Harley realized an unprecedented fourfold increase in throughput in half the time, powering annual growth of more than ten percent. In “The Lean Machine,” Oosterwal shows the day-to-day transformation at Harley and identifies universal change and improvement issues, so that companies in any industry can incorporate knowledge-based innovation with predictably excellent results. Oosterwal will receive his award at the awards ceremony during the Shingo Conference in Orlando, Florida, USA on April 9-13, 2018. The conference is a week-long event featuring a selection of workshops, plant tours, keynote speakers and breakout sessions designed to provide ongoing knowledge, insights and experience for organizations in pursuit of operational excellence.